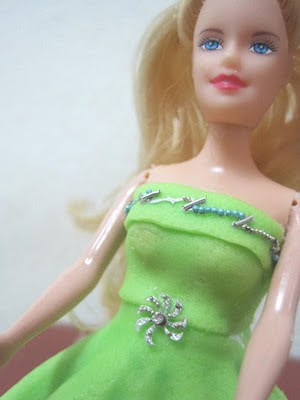 Mom bought me a doll, no, I'm no more a little girl, she bought me the doll because she wanted me to make a doll cake. Oh no....I'd never made one before. It's a challenge to me, how was I going to make it? 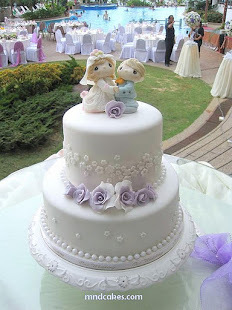 I had seen many great doll cakes made by other fellow cake designers. Yeah, I guess mom read my wish. I hoped to make it one day. Thanks mom. Her initiative had really pushed me a step further to realize my concept of a doll cake's how-to. I used the green fondant left over and mixed with yellow food paste colouring. Yes, apple green, I got the bright apple green as the gown's colour. Again, mom found some fashion jewelleries kept for decades in the drawer. She suggested me to put them on the gown and hair. Oh well, they're not edible, I thought it was alright as I could remove them before I asked my niece to cut the cake. Finally, the doll cake was presented to my niece, Lina though her birthday was a month away. She was so surprised and when I asked her to cut the doll, she got really shocked, "what? How can we eat her?"